Over the years we have been reporting on illegal immigration. We have shown you that UN Agenda 21/2030 calls for NO Borders. It requires and demands that the UN be the end-all-be-all for its One World Governance. All policies must comply with the UN. One just needs to look at the actions of Obama and Bush, to see where their orders came from. They come from unelected boards and regional councils – created right out the UN play book. The ultimate goal is to strip America of its wealth and natural resources, mainly by the use of “Trade Agreements”, to make the US Constitution subservient to the UN Charter, to eliminate private property in the name of FAIRNESS, and to divert America’s economy to third world countries in the name of eliminating hunger and poverty. In the last 70 years since its inception, the UN has been the recipient of Billions from the US. Yet, we still have disease, hunger and poverty in third world countries. No one ever asks: WHY? Perhaps if the UN communists and the variety of dictators – the real recipient of the billions – were not stealing, their people would have money with a self-sustaining economy. How do I know? Again, I will ask – Where are the Billions that Americans donated for the Haitian people as a result of the earthquake? I know it was given to the Bush/ Clinton coalition; but somehow it never got to the Haitian people. It is time to stop the money train. You know, like those commercials stating “just donate $19.95 for starving children in Africa.” Wonder why after 40 years of donations – we see the same commercials over and over again? REALLY? Have you ever looked at the salaries and overhead of those UN sanctioned organizations? They just want OUR MONEY. They tell us, we just don’t listen. We don’t believe they mean what they say. This is a breakdown of ONE of the groups bleeding the America people: the IRC. The International Resettlement Committee, headed by David Miliband gets it orders from the UN. 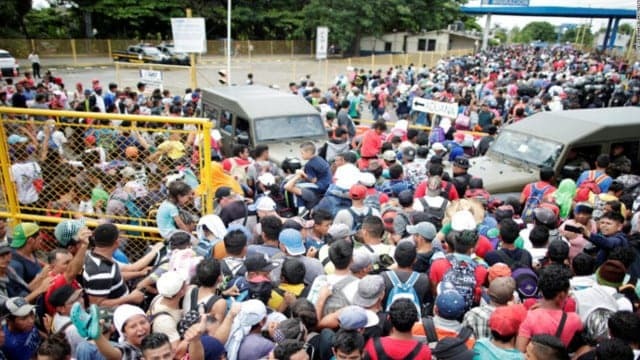 Who do you think is funding those caravans? The UN determines how many and how much and is currently paying many religious charities to accept refugees while Americans can not put food on their tables and veterans sleep in tents and cars. Wait…that David Miliband is not THE David Miliband, failed Labour Party leader in England? Tell me NO, it’s not possible: It is possible, and now David Miliband has a new gig, as the Refugee Resettlement Head of the UN. How much does he make for working 37.5 hours a week? Aside from his bloated salary, what did he just say: Resettlement contractor David Miliband admits your anger over Syrian refugees is a threat to “Global Governance”. Finally, the Truth: WHAT does David WANT? Sustainable Developments, so that people can be MANAGED and CONTROLLED. The Regime can’t have any “threats” to their dominance and plans. Who will head this Global Governance? Why, the U.N., of course!! David’s International Rescue Committee (IRC) – is really a lobby group that “awards” good officials and bureaucrats for doing their bidding. George Soros and the late John McCain are some of the recipients. Remember that awful bill headed by the Gang of Eight. IRC also lobbied the Gang of Eight – including Marco Rubio!! Just to make things easier, the IRC has an office in Washington, D.C.
Why are Americans ignorant of the theft by the UN NGO’s? Because of the Mainstream Media, and Public Schools. The schools who now teach the government is the answer. Americans are now being taught: Do not resist. Do not question the government. You must comply. You must be PC. Go along, to get along. Do more for less. America is bad. Only the UN can help. So, following Cloward & Piven: In order to destroy capitalism, overload the system, Americans sit silent, while HUNDREDS OF THOUSANDS of illegals and refugees who will not assimilate…take our TAX DOLLARS. They take our money, our resources, and our freedoms. Are you still a member of the silent majority? Do you finally realize that if we lose our FREEDOM, Americans will join the rest of the third world in poverty? Illegal immigration and refugee programs are not about helping anyone. IT IS ABOUT DESTROYING THE WEST. DESTROYING AMERICA. while creating a global regime who will dominate the world. Money, Power, Control. It’s all there. Will you sit and watch – or will you learn and act? Sweden got the message. Switzerland got the message: The military leader told the people to buy MORE GUNS TO PROTECT THEMSELVES. The UK, Czech President, and French PM all said: THIS is NOT about Refugees, this is an INVASION!! ♦ The corrupt Dems/Globalists spend billions restricting Americans while the border is open letting invaders in. ♦ The corrupt Dems/Globalists spend billions building borders in foreign countries while the border is open letting invaders in. ♦ The corrupt Dems/Globalists want gun control of Americans making protecting yourself harder, while the border is open letting invaders in. ♦ The corrupt Dems/Globalists want background checks (already ruled as unconstitutional)…while the Borders are open, letting invaders in! ♦ Americans are called terrorists, while protecting their land from unconstitutional NGO’s while the border remains open letting invaders in. ♦ The corrupt Dems/Globalists focus on the climate diversion while the borders are open, letting invaders in. ♦ The corrupt Dems/Globalists control the media and report lies about the border. Make no mistake, the corrupt Dems/Globalists don’t care about refugees or illegals, they only want their votes to remain in power and steal our freedoms. End the PC BS. Demand the truth. 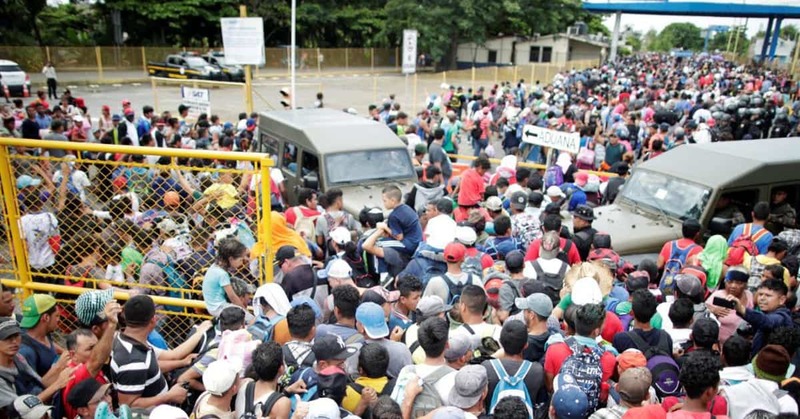 In the end, Americans will pay with their LIVES, MONEY, and COUNTRY – while the Border remains open, letting invaders in. Can you see it? Vanishing not far off in the future, just down the road…?? Such is the Demise of the Great American Dream. Talk to friends and neighbors. Go to town meetings and demand THAT YOUR LEGISLATORS take a STAND! Meet with your Sheriff. Who will they protect? Only support a candidate who will CLOSE THE BORDER and protect Americans – not the invaders!! Vote out the criminals in office who do not feel Americans are worth protecting. Support companies who support your cause. Do what they do and boycott. Demand an end to sanctuary cities and states. Support E-Verify. Let your legislator know: BUILD THE WALL! If not YOU … WHO? If not NOW…WHEN?